Stating the Perhaps-Obvious, But Maybe-Not-All-That-Covered – Because Why Not? I know not much, but I know enough to know there’s several people out there who’ve already done their homework on “solving for Apple Watch” – based on the obfuscated-but-not-overly-so first, blended data point (Other Products) expected sometime in late July (FQ3 2015 earnings announcement/info release). Apple is smart to 'hide' Watch volume in future financial results. Its success is about more than a quarter or two of sales. The latter two perspectives hardly get my Apple fanboy blood boiling or anything. But as I’ve previously said elsewhere in my blog – why not compare numbers to narratives to the extent possible? There’s a 4-quarter period from FQ3 2013 through FQ2 2014 where Accessories YOY revenue growth was essentially flat, before stabilizing in FQ3 and FQ4 2014. The Company sells a variety of Apple-branded and third-party Mac-compatible and iOS-compatible accessories, including Apple TV, headphones, cases, displays, storage devices and various other connectivity and computing products and supplies. In July 2014, the Company acquired Beats Electronics, LLC, which makes Beats® headphones, speakers and audio software. Thinking back, I can wild-guess headwinds including holiday (FQ1) seasonality, decreasing need for Lightning cables and adapters following the iPhone 5 release in FQ4 2012 😀 (particularly with lower-priced alternatives joining the Made for iPhone/iPad crowd), declining iPad sales affecting related accessory sales, and maybe a side of increasingly aged Apple Displays, Apple TVs and the cloud trend making devices like printers and hard drives somewhat less popular. 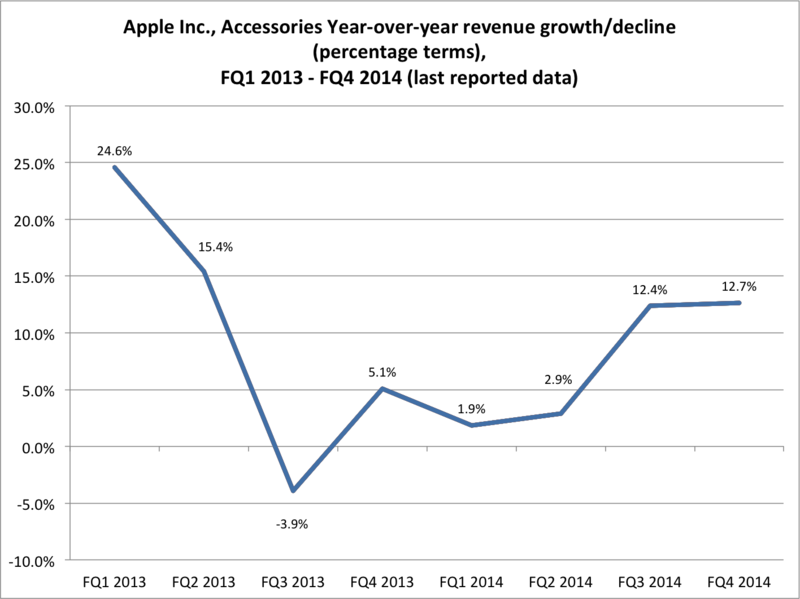 But then, Accessories rebounded in the “June” and “September” quarters. FQ4 (covering approx. Jul-Sep. 2014) could be explained by the Beats acquisition (completed in July) with some help from iPhone 6/Plus. But that doesn’t explain FQ3’s similar percentage growth, covering Apr-Jun 2014. Was it related to Greater China’s 28% YOY revenue segment growth (read: mostly China Mobile iPhone 5S sales)? Apple can’t recognize revenue from companies not formally acquired as of that date, right? Apple didn’t say anywhere in the 10-Q filing far as I can tell – probably quite intentionally. Anyway, Accessories, as the formerly-dominant component of “Other Products”, probably figures to be a tailwind for the new category based on recent trends. Assume YOY growth of maybe 15% from FQ3 2014’s $1.325B (trying to account for Beats, which I’ll get into a bit later), and Accessories could be “as high as” ~$1.5B for FQ3 2015. Yes, as in not milestone. Not any longer. Exhibit A: the stalactite-looking bar chart below. In the absence of any iPod updates other than price drops and a lower-capacity/price iPod touch, plus Tim Cook’s essentially saying “you’ve done good work iPod, and we’re continuing to move away from Apple’s ‘transitional product line'” – the, uh, floor’s the limit. Let’s put it this way. 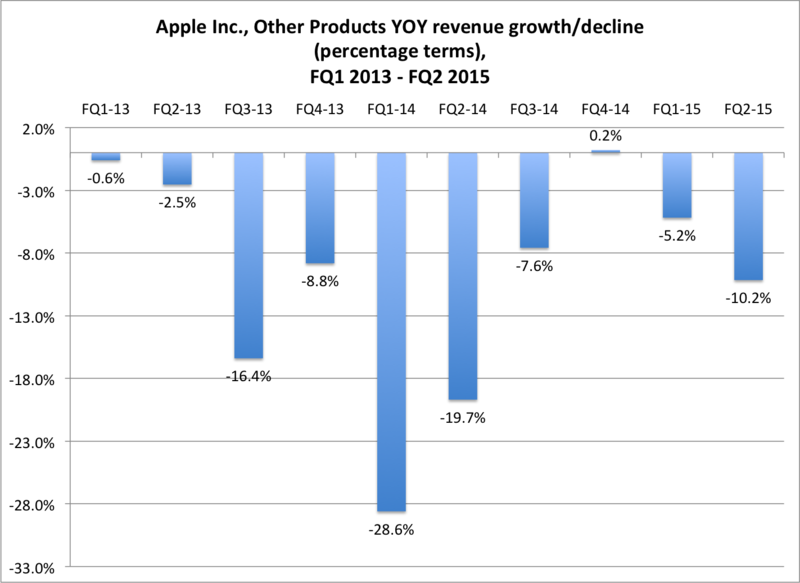 Other Products revenue declined year-over-year from FQ1 2014 ($2.836B) to FQ1 2015 ($2.689B), a drop of close to $150M, “despite” Accessories being a presumptive tailwind (y’know, iPhone 6/Plus and all) and fairly dependable growth category, plus being further boosted by holiday seasonality, which I assume would translate to, who knows, $200-400M worth of Beats revenues added to Accessories (if it still existed). For a company that’s so high-profile, and presumably still in a high-growth phase as far as the presumptive core business (headphones, speakers) is concerned, it’s really hard to see the contribution to Apple’s top line. To recap, we know Apple started recognizing Beats revenue as of the July acquisition (how could it not). But Apple turned in remarkably similar Accessories revenue growth rates both “before Beats” (FQ3 2014) and “after Beats” (FQ4 2014). (b) perhaps more likely and more “sobering”, Beats hardware sales are lower than the “consensus”. Run some reasonable-seeming projections for ex-Beats Accessories growth and iPod revenue decline in FQ1 2015, and the possible ranges might surprise you. To quickly recap, what do you get when you combine a “decent-but-fairly-modest” rising trend in higher-revenue Accessories with put-out-to-pasture iPod? 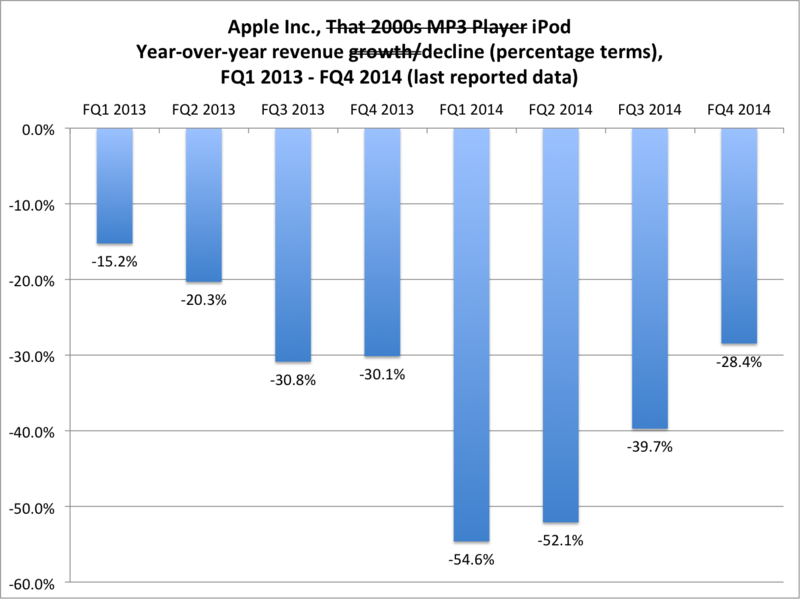 At some point soon, iPods will become so irrelevant as to stop “hurting” Other Products category growth (on a related note, Apple’s probably doing its best to ensure iPad doesn’t suffer a similar fate). For now, though, there’s still some distance between the year-ago compares of the $400M level (FQ2-FQ4 2014) and, well, zero. It would’ve taken more than one year of 10-20% growth out of “Accessories” (pre-Watch) to make up for that. X Minus $1.7B or So = What, Exactly? I know, I know. Assuming you found any part of this blog post of “use”, that still doesn’t answer the question of how many Apple Watch units were sold in its launch quarter. And without units, there’s no way to get a “definitive” “ASP” number (note revenue deferral/amortization, extra Watch band purchases, etc.). Well, we’ve been warned on more than one occasion that unit numbers are not forthcoming. And they may never be, even though Apple Watch revenue will be fairly transparent (blithely assuming my assumptions are somewhat correct, and that in the future, Apple doesn’t blend Apple Watch revenue with…well…). Yes, semi-solving for Apple Watch revenue and educated-guessing for Apple Watch units may not be particularly satisfying, much less “illuminating”. But I humbly submit this thought exercise shows that getting a half-decent clue as to both (absent a huge boost from Beats hardware) isn’t too difficult. ** “Blended Trend” sounds like a good name for a drink at an establishment frequented by a bunch of Wall Street trader types, don’t you think? The bad puns are always free at The AAPL Tree. *** Except in terms of keeping unit sales and ASP specifics safely out of the competition’s reach.